So let’s get back into the Tree of Life. In our last piece here, we dug into the first sphere on the Tree of Life which is Sphere 0, known as Amen. Amen deals with the state of God/Humanity in “the beginning”, our qualities of being unconditioned, unprogrammed, undifferentiated, and having unshakeable inner peace. Spheres 1 through 3 describe God’s attributes of being all-knowing, all-powerful, and ever-present (Ausar, Tehuti, and Sekert). The explanation of these spheres shows how humanity taps into these attributes. It’s immeasurably important to understand that human beings are the vehicle through which God experiences him/her/itself. There is no separation between God and human beings. The only thing that prevents us from being able to use the powers of God is the separation that we imagine to exist between God and ourselves. It is a false belief that prevents us from being fully human, which means to be fully divine. Spheres 4 and 5 on the Tree of Life are called Maat and Herukhuti. Maat refers to the laws of nature. A major principle expressed by Maat is that everything in the universe is connected to everything else in the universe. “No man is an island” so to speak. 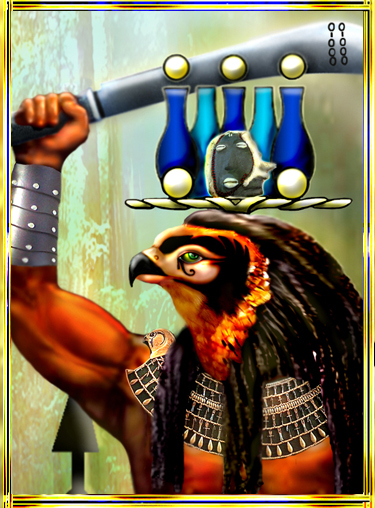 To be in accordance with Maat is to understand how your thoughts, words, and actions are going to affect everything else that you are connected to. When we don’t understand our interconnectedness then we attempt to solve problems in ways that create new problems. In the 20th century, the largest producers of food sought to develop ways to produce more food, at lower prices, in order to keep up with the demands of growing populations and increase their profits. Their solution was to popularize food processing. Benefits of food processing include toxin removal, preservation, easing marketing and distribution tasks, and increasing food consistency. In addition, it increases yearly availability of many foods, enables transportation of delicate perishable foods across long distances and makes many kinds of foods safe to eat by de-activating spoilage and pathogenic micro-organisms. Modern supermarkets would not exist without modern food processing techniques, long voyages would not be possible and military campaigns would be significantly more difficult and costly to execute. There are downfalls to this phenomenon of food processing. Processed foods provide lots of calories with little nutrition, they are addictive, and they contain dangerous additives. There is a direct correlation between the rise in the amount of processed foods and the rate of obesity and diseases that are closely related to obesity. These foods are literally killing people. I don’t know if the scientists and corporate executives who originally created food processing were aware of the possible fallout from what they created but I doubt that most people would’ve agreed to adopt the new Standard American Diet (SAD) if they had fully understood the ramifications. This is what we run into when we don’t properly respect Maat. Maat reminds us that everything is connected and every action has an equal and opposite reaction. Actions have consequences. When we ignore Maat then we are forced to deal with Herukhuti. 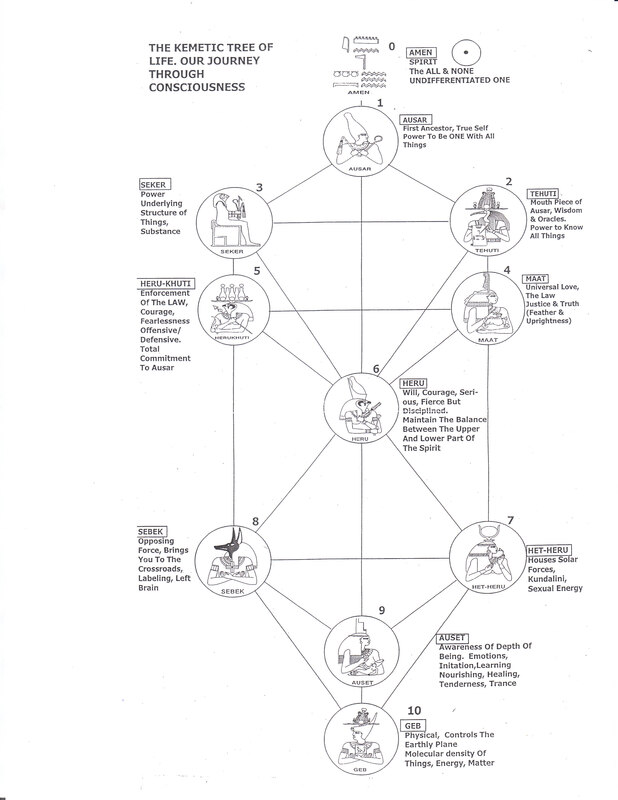 Sphere 5 of the Tree represents that aspect of Spirit from which Divine/Natural Law is “enforced.” The wrath of God (punishment) is exercised through this faculty, as is the love of God in its protective aspect. There is a balancing logic at work here. There is no law without means of enforcement; therefore Herukhuti is needed to complement Maat. These deities are not beings up in the skies somewhere that control the fate of us lowly humans. These are faculties within us and within nature that are always at work in our lives and our success or failure is determined by how cognizant we are of the existence of these principles. Herukhuti represents the natural consequences of our actions. If you put a bunch of carbon into the atmosphere then you will destroy the ozone layer and allow more of the sun’s ultraviolet rays to penetrate our bodies. That is especially troublesome for people who don’t have darkly pigmented skin. If you respond to polluted drinking water by consuming countless numbers of plastic water bottles and then having no way to get rid of the plastic then you have fixed one pollution issue by creating another. Maat and Herukhuti are on the Tree of Life to remind us to consider all the different consequences of our intended actions. This leads me to a somewhat controversial point that I must make: there is no such thing as “right” and “wrong”. Right and Wrong are concepts that assume the existence of a (paternal) deity who has a strict agenda and punishes us for going against His wishes. This type of deity doesn’t exist in reality. The Universe doesn’t have preferences. Again, Amen represents unconditioned, unprogrammed, total darkness. Amen simply wants to experience the potential of what is within the darkness. There is no preconceived agenda of how things are supposed to go. Anyone who properly understands the laws of success can achieve their goals whether they aim to feed the hungry or make a billion dollars or enslave a whole nation of people. These things are all within the realm of possibility. Right and wrong are relative to your goals. If you decide that your goal is to gain ten pounds of muscle, then inherent within the goal there are things that you should do and things that you shouldn’t do. You should do some strength training, you should eat small meals to keep your metabolism high, and you shouldn’t eat a lot of sugary and fatty foods. But if you decide that your goal is to learn how to levitate then you are going to have a completely different set of rules to live by. And the goal is different for every single person on the planet because we are all born with a different life path, based on the unique talents and gifts that we are born with. What is right for one person is not necessarily going to be right for another person. One size does not fit all.